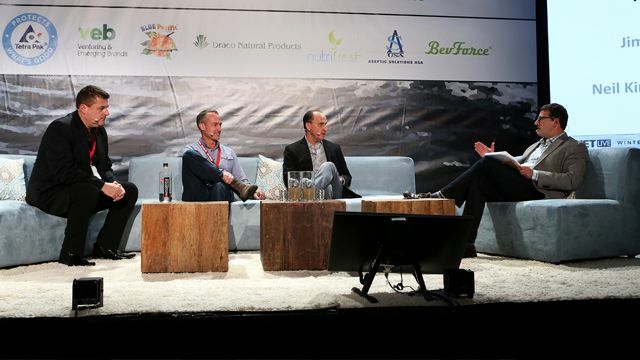 Day 2 of BevNET Live Winter '14 offered deep dive on trends, innovation and current issues affecting the beverage industry. Hayden Slater, the CEO & Co-Founder of Pressed Juicery, kicked things off with a presentation on booming growth and expansion of the cold-pressed juice brand. A spirited and highly informative discussion titled "Mining Trends to Develop Innovation" featured Julie Key, Brand Marketing Director, Evolution Fresh, Alan Murray, CEO, GoodBelly, and Greg Steltenpohl, CEO, Califia Farms, each of whom shared details on how their companies identify innovation with an eye on product and brand development. Later in the day, Coca-Cola executive Mary-Ann Somers, the company's director of water, tea, and coffee brands talked about how entrepreneurs' should examine the potential for brand growth in the context of what the current market can bear. BevNET then sat down with Ben Weiss, CEO, Bai Brands in a discussion that explored the strategic shifts that take a company’s emphasis from execution to brand-building, a talk followed by one on how to build inside influencer accounts, with Patrick Posey, VP of Sales, Bristol Farms; Mike Hendry, VP of Marketing, Northgate Gonzalez Markets. Rounding out Day 2, Dr. Jay Udani, Founder and CEO, Medicus Research, shared insights on regulatory issues on blurring lines between food and beverage and drug and supplement, and wrapping up with a discussion titled "Build the Category, or Build the Brand? — When Pioneering Brands Grow Up."